In reality though, liking a movie because you agree with it’s content doesn’t actually have anything to do with whether or not a movie is good or bad, it’s simply the base layer of determining whether or not you enjoyed it. This means that whether or not Christians enjoy something doesn’t usually have anything to do with whether or not it is of notable effort or prime quality. Think of a 6 year-old who loves his dinosaur print shirt, he doesn’t love it because of the fit or quality of fabric, he likes it because he likes dinosaurs. Very little consideration is given to the design, color scheme, or appropriateness of the bumper sticker because it’s being evaluated solely on the accuracy of its message. Because the Christian consumer often cares very little about the appropriateness or context of the messages they love, the creative work that goes into “Christian media” tends to be messaging heavy, to the detriment of quality, believability, and ultimately its effectiveness. When you apply this approach to the bumper sticker analogy it becomes easy to understand why we drive around with jokes about hell and puns about politics on our car. We don’t care if our message is helpful, we care whether or not it’s “accurate”. You see we are under the mistaken assumption that if something is true, then it’s always applicable and immediately relevant to every situation. While 2+2=4 is absolutely true, it can also be completely irrelevant in a conversation about what color red your barn should be painted. If you really think that “God says it, so I believe it, and that settles it” then you can put that slogan on your bumper sticker, but the only thing that it really accomplishes is communicating that comments about your driving will be disregarded, unless they are mentioned specifically in the Bible… since no one in the history of highways was ever having a conversation about what they think someone in another car might believe about God. In my experience, most Christian storytelling is made to encourage audiences who already agree with the messaging, while encouraging them to invite their friends to experience “The Truth”. That truth, while possibly helpful, is generally packaged with very little of the creativity or subtlety that are historically the benchmarks of good art. -True Love, Self-Actualization, and Eternal Security/Record Deals. I’m pointing this out because Christians tend to get worked up over WHAT happens in a movie, to the detriment of WHY it happened, and whether or not it happened convincingly or believably. This means that we tend to present idealistic depictions of improbable events, instead of honest portrayals of human interaction. We deal in “best case scenario” fantasy. Which is why people who don’t come to church can struggle to relate to us. Because when was the last time all of your fantasies were fulfilled by one decision? Hasn’t your entire life been a struggle to carry out a series of righteous decisions? Isn’t it filled with painful interactions? Aren’t there massive areas of your heart that you’re struggling to surrender to God? Because that’s an honest and believable description of my human interaction with God, and it’s one that I haven’t really seen in a theater anyplace outside of say… Darren Aronofsky’s Noah film. Now I’m not suggesting that the problem of “ham-fisted” preaching to the choir is unique to Christians, just that it’s widespread throughout Christendom. …for instance people who love the CBS shows already believe that young people are mostly ignorant, undisciplined, tattooed, and unstable. This makes them “good suspects” and easy to identify “villains” while also allowing them to learn valuable discipline through the mentorship of an awesome and skilled middle-aged team of accurate and logical police/military/science detective investigators. Sadly, this over focus on “messaging” obscures and diffuses the human element in story telling, and when you remove that kind of subtlety your product becomes obvious propaganda and loses it’s effectiveness with wider audiences. I’d submit to you that Christians see propaganda in everything because we are both propaganda producers and propaganda connoisseurs. And what if we don’t actually have the market cornered on accuracy like we think we do? In the case of “Noah”, many of our beliefs about “the Biblical” story come from our childhood lessons, and Christian depictions of Biblical stories aren’t always as accurate as we think they are. We don’t have as much “reverence for the Biblical story” as we think we do. See I haven’t ever heard anybody complaining about any depiction of the Noah story by pointing out that the animals didn’t all arrive two by two. Because most of us “Accuracy Enthusiasts” don’t know that the animals didn’t come two by two. The unclean animals came two by two, but the clean animals came in groups of seven. Is it possible that Noah’s “dangerous environmental message” is actually more Biblical than modern industrial age Christians are comfortable with? Because both the movie, and the book of Genesis suggest God’s displeasure about how human sin has broken and tainted an earth that “soaks up our blood” and “groans for redemption”. As for Noah’s righteous vegetarianism, don’t forget that it’s entirely possible that mankind was not intended to eat animals before the flood. Remember that God gives Noah’s family permission to eat animals after they get off of the ark (possibly explaining why more clean pairs of animals were needed on the ark). Darren Aronofsky’s Noah is given trees by God and shown using them to build the Ark. The environmental message of Noah isn’t that trees and animals are sacred, it’s that disobedience, greed, and waste are an affront to Our Creator. 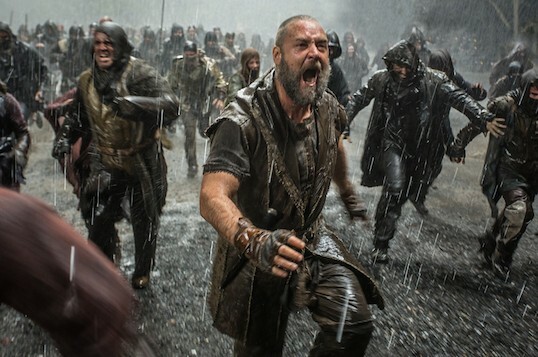 I’m not writing this to defend “Noah”; the movie is certainly a flawed execution of a convoluted vision. I’m writing this because it’s time to recognize that we aren’t so much complaining about “corrupting the Noah story” and “Hollywood mocking our faith” as we are complaining that someone’s propaganda doesn’t match up with the propaganda we hoped to see. That’s right, I think that Noah is filled with the kind of believable and realistic interaction that infuses the story with compelling human drama, but it does so at the expense of any meaningful divine interaction. When God speaks it’s esoteric, confusing, and frustrating to both Noah and the audience. Aronofsky’s Noah is “righteous” because he does morally good things, but he doesn’t get to know God, and because he can’t understand him, he can only fear him. Noah has a compelling relationship with everyone BUT the God he worships. This happens mostly because Aronofsky’s God is distant, perplexing, and like us, loves animals more than people. This isn’t intended as an insult to God, Aronofsky is always reverent, it’s just the only way someone who doesn’t know God can portray him. Aren’t we tired of saying, “Noah is a bad movie because it was a factually inaccurate depiction of a Biblical story made by an atheist intent on mocking my religion”? Because that isn’t true and it isn’t fair. And the right ones push us closer to the loving God we can actually know. It’s entirely possible that Aronofsky’s “Watchers” are not simply a blasphemous Hollywood invention meant to spice up the movie. Immediately preceding the Noah Narrative, Genesis speaks of “Sons of God coming to daughters of men” during a time of “legendary heroes”. Many evangelical Christians and Jews believe this passage to be speaking about angelic beings that rebelled against God and produced gigantic offspring with humans. Those who hold this view see the event as precipitating the flood, with God cleansing the earth of the supernatural progeny. It is also common to meet sincere and believing Christians who understand Adam and Eve to have been spirit beings who were “clothed with skins” by God after their sin. Clothing the spirit Watchers in “earth” to give them form would be in keeping with many reverent, traditional, and cultural interpretations of Genesis. …Just not the common, evangelical ones. While I may not necessarily agree with Aronofsky’s interpretation and on screen presentation of these passages, they are not as far afield as you might think, and they aren’t attempts at mocking of our faith. If you are interested in understanding what Darren Aronofsky was actually communicating with his movie (Kabbalic Gnosticism) and how it differs from Christianity, I’d recommend you check out this excellent dissection by someone tackling the larger and deeper theological issues that you should have with the movie. I’ve not seen it yet, but certainly people can suggest others watch it and them it opens to the door to telling the whole story of Noah, the Nephilim, and why in fact God decided to wipe the face of the earth clean. Like you said, out childhood depictions aren’t all that correct. We are shown that God kills nearly everyone because people are being bad and breaking a stick over someone’s head, when in reality (or at least one reasonable theory, IMO) is because the bloodlines of humanity were infected with the Nephilim in an attempt to corrupt all of humanity and prevent the coming of the Christ. We can use what the world gives us to point the way to the truth, so long as we don’t cause such a negative scene and drown out our credibility. Related note: Noah Primeval by Brian Godawa is another take on the Noah story, and while I didn’t like it as much as I wanted too, it’s heart is in the right place. It at least attempts to show the world in a richer way than we tend to see the fantastic stories of the Bible. Yeah….I didn’t expect a biblical representation but with the awesome looking trailers and the high powered cast I did expect a good movie and a compelling story. In all honesty I got dragged against my desire to see “I, Frankenstein” a month ago ….which was TERRIBLE…. The Noah movie was worse! If they had shown the stupid looking fallen angel-rock-monster-watchers in the trailers very few people would go see this….it was soooooo bad. I was sooo hoping for something better. Not gonna lie: if there was a movie about a Fighter Pilot who love interest was a Hardworking 19th Century Farmer and he had a problem with Sports Achievement/virginity but later believes in God and then finds True Love, Self-Actualization, and Eternal Security/Record Deals, I’d be all over it. Best Case Scenario Fantasy at it’s finest! Where is the “Like” button on this thing? I’m totally confused by its absence. Me senti vendo a nossa presidenta Dilma falar, não se entende nada , não diz coisa com coisa, falta nexo e sentido no post. I think this audio program does a nice job of explaining the parts of the “inaccuracy” that we need to worry about, as well as a few tips for watching any movie.